This thing's scary me, honestly. When you see it in it's full glory it's rather clown-like (which isn't a bad thing in my book) yet something about it is.... freaky. Hmm. What started as a play around with thrumming (suggested ages ago by Mary-Lou) may well have ended up a disaster... or not? Instead of thrumming the 'proper' way, I've allowed the fleece inserts to hang loose and go fluffy, man. And as it's knitted in the round on a stocking stitch ground, the stitches where the thrumms were added were purled, then knitted through the back of the stitch on the next round (with me so far?) Anyhow, stopping after a few rounds, both me and Tom kinda looked at it and went.... "err...yeah". 'Nuff said. I carried on in the vain hope that something good might come of it. Then Tom started asking me about what might happen if I were to felt it (impressed? my fella's getting the hang of this wool malarkey don't you think?)... and then I had a realisation. Sorry if I've confused about the cashmerino/felting issue.... I know it doesn't felt as I made some socks from the aran and they've survived several runs in the washing machine. Also read somewhere on UKHK that it doesn't. 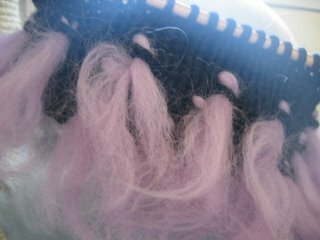 Which is cool, as I meant to imply that the fleece additions/thrumms will felt yet the main body (cashmerino) won't, making (hopefully) wonderful little odd felting shapes all over the hat... jeez... can you tell I'm a teacher?